View from the Zaamin Mountains of the Pamir Range looking north over the Ferghana lowlands. On a particularly cold autumn day, in October of 1908, at roughly 6,000 masl (over 19,500 feet; nearly as high in elevation as the highest peak in North America and far higher than any in Europe), in the Kunlun Mountain range of western China, a British-run expedition, out of Derha Dun, India, stood atop a glacier with their survey equipment. The glacial-covered valley marked one of the lowest elevation passes through this stretch of the southern Himalaya region. Sir Aurel Stein, the legendary explorer and Silk Road enthusiast, led that expedition, continuing on against the experienced advice of his Kyrgyz guides, and succumbed to serious frostbite, losing the toes on his right foot. This “awkward mishap”, as he would later refer to it, came only months after he rallied his team of researchers, porters, and a fox terrier, named Dash, to make the roughly 500 kilometer trek across the arid Taklimakan Desert, from the north, to find the mouth of the Keriya River. After surviving in the parched sands of Asia’s most inhospitable desert, tucked into the rain shadow of the Himalaya, Stein found himself on a stretcher carried for 480 kilometers to the nearest hospital in the city of Leh, the former capital of the ancient Ladak Empire. The frostbite marked the end of his second expedition to study archaeology and geography of the ancient Silk Road, which he had embarked upon two-years earlier, in 1906 . In 1925, after three multi-year expeditions to “Inner Most Asia”, he wrote for the Royal Geographical Society that “[o]n looking at the map it may well seem as if this vast region has been intended by nature to serve as a barrier between the lands which have given to our globe its great civilizations, than to facilitate the exchange of their cultural influences” (1925:378 ). Following Stein’s prompting in this quote and looking at a conventional map of Asia today, invariably the cartographic key is in the upper left-hand corner, the reverse is true when looking at that map’s European counterpart. The cartographer places the key, and/or chooses where to cut off the borders of the map to maximize its usefulness. Therefore, the key often covers up the least used area of the map, and few of the people who are likely to utilize the map are going to look for the location of, for example, Aktobe in central Kazakhstan. Therefore, most of the typical modern maps of Europe or Asia either cut off or cover up (with the key or legend) part or all of Central Asia. Today’s typical European, North American, or East Asian seems to have forgotten that this broad expanse of mountain and steppe even exists. While Central Asia has been the epicenter for empires and the crossroads of cultures for millennia, it seems to have faded out of humanity’s collective memory. As I am endeavoring to drive home through this research, the people and cultures of this long-forgotten land directly shaped human history. Likewise, the environment was closely intertwined with humans, and, as I illustrate in my scientific pursuits, the Central Asian landscape played an important role in determining the flow of goods along the Silk Road. The hazards of Central Eurasia are evident in the accounts of the heroes of adventure from the late nineteenth and early twentieth centuries, tempting the Fates for the sake of exploration and imperial expansion. The seemingly mythical tails of these early European explorers are recounted in numerous tomes [3, 1]. The hardships of the rugged terrain of the Silk Road are clearly depicted in the sad fates of many a small canine of European breed, dragged along as companions for the European adventure-seekers. To bring a small dog in a saddle bag on a mission to the ‘roof of the world’, may seem odd, but the routes of the ancient Silk Road are littered with the graves of these unfortunate pups. William Moorcroft, a well-off middle-aged English man, left his wife and friends to travel into the heart of darkest Central Asia as a horse doctor for the British crown, and ultimately became a legendary explorer. Moorcroft lost his devoted spaniel, Missy, to heat exhaustion in the Khybar pass in 1824 on route to Kabul . The great historian, archaeologist, explorer, and Jack-of-all-trades scholar, Aurel Stein, never left home without his faithful fox terrier, named Dash (Figure 1.5). The media and history books have made Dash into a timeless hero, as he passed some of the most rugged landscapes on Earth and was by Stein’s side in every media photo opportunity. Dash had a very hard time dealing with the extreme climates of Inner Most Asia, and had to wear a Kashmir fur coat from December to March while on expedition in the northern Taklimakan . However, few readers realized that Dash rarely survived these journeys, and Stein had to refurbish a new ‘Dash’ every few years. The famous Russian explorer, Przhevalsky, took his dog, Faust, a pointer for companionship and also to retrieve game (a slightly more practical use and breed), the latter being especially important because he brought limited supplies on his first expedition (but abundant gun powder and shot). The dog could not keep up with the company and was carried on a tuft of grass on horseback at points, its paws were bloody from the salty soil, and was eventually buried on route. However, the pointer must have been useful, because on a follow-up, and much more sufficiently supplied expedition, through the Ili Valley to cross the Tien Shan, he brought two dogs, named Bai and Oskar . Bai became too exhausted to complete the journey and was sent back on a special side excursion to Kuldja and presented as a gift to a colonel there. Eventually on the mission, Oskar would tire as well and Przhevalsky is reported to have stated “I even have difficulty getting the choice of dog right for an expedition” . The truth is, the choice of pooch has nothing to do with it (unless maybe it was a Tibetan Mastiff or a courier dog from the Da Sheng Kui), the terrain is far too rough for most people or ‘beasts’. Figure 1.5 Sir Marc Aurel Stein on his third expedition (1913 – 1915) to study the Silk Road, accompanied by his fox terrier, Dash. 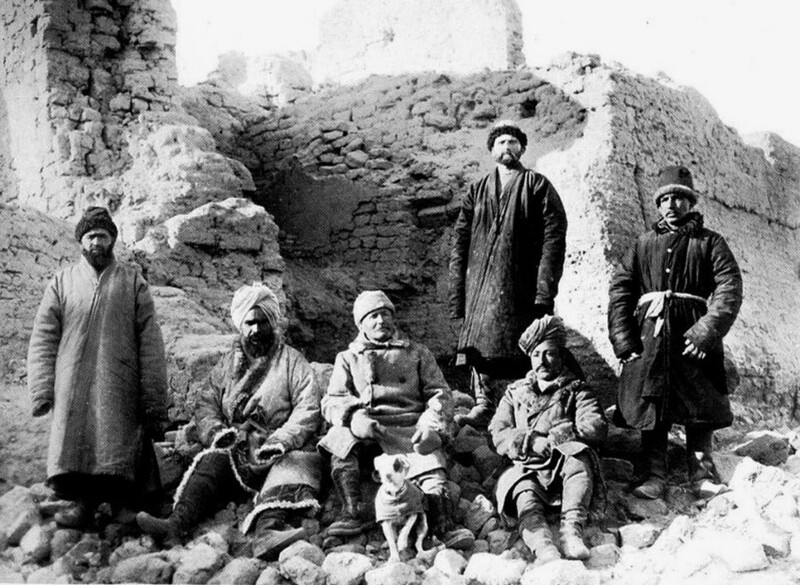 Photograph was taken on January 27, 1915, in front of the ancient Silk Road city of Gaochang in Xinjiang – photo provided by the British Library, India Office Select Materials, also from Innermost Asia, Volume 2, Figure 332, with the caption “Group of my party at Idikut-shahri, Turfan. From left to right: Ibrahim Beg; R.B. Lal Singh; self with ‘Dash III’; Musa Akhun; Afraz-gul Khan; Jasvant Singh. Ruin of Khitai-madrasah in background.”. The Photograph is also published in  Plate 23. In fact, the only one of the great explorers’ dogs that may have been suited to the terrain was that of Captain Brooke Dolan, a USA OSS spy on a mission to obtain permission to pass American supply routes peacefully through Tibet to fight Japanese forces in China. Dolan departed on October, 1942, and upon arriving in Lhasa met with the, then seven-year-old Tenzin Gyatso, the fourteenth (and current) Dali Lama, who had ascended the throne in a ceremony two years prior . The mission was a success, despite the fact that the US Army never used the Tibetan mountain passes, Dolan was given gifts of honor, including 2,800 pounds of barley and peas, 240 pounds of potatoes, and a small hairy dog of the local breed of Lhasa Apso. Dolan named this dog “Miss Tick” , the dog was adapted to the cold harsh mountains of Central Eurasia, but it was too small to keep up with the mission, so Dolan carried it in his saddle bag. Historians working in Central Asia tend to focus on the vast expanse of grass that blankets nearly the entire country of Kazakhstan and sprawls into adjacent regions. From an aerial view, the short-growth, Stipa-dominant, semi-arid landscape appears flat, empty, and seems to continue along like a road to the horizon, leading horse-bound travelers in any direction they choose to follow. It is exactly this perception of the steppe as a smooth endless highway that has led to ideas of vast migration (particularly dominant in Soviet archaeological literature). Popular notions of Central Asia’s prehistory tend to be overrun by images of mounted warrior nomads, traversing vast distances across highways of grass, with the sole intention of raiding defenseless agricultural communities. In this sense, the steppe highway has been immortalized in scholarly literature as an unbarricaded road leading consecutive waves of nomadic invasion to the doorsteps of Europe, southwest Asia, and China. The scholarly fascination with this expanse of prairie has framed the grass as a focal point in history books – the unexplored periphery of the ancient world and source-land for the warrior nomads, who seem to invade under a new banner with every successive generation. The Steppe is Herodotus’ mystical land of supernatural beings, Amazonian warriors, and Scythians, who drink libations from the skull-caps of their fallen enemies. The idea that the grass-dominant ecology of the steppe facilitated easy transport is often used by archaeologists to explain perceived similarities in cultural characteristics on opposite ends of Eurasia [7, 8, 9]. Notably, art historians have explained the widespread distribution of a distinct artistic form and certain technological innovations attributed to mobile peoples, through long-distance movements of people laterally across Central Eurasia, covering territories from Ukraine to Mongolia . The steppe is usually discussed by scholars in terms of a large homogenous culture with people connected by long-distance east-west migrations, a view largely tied into modern political dynamics, but also to the fallacy that transport across the steppe would have been (which it is not today, even with established roads) easy and similar to driving on a highway. The image of the horse-back warrior nomad, the Scythian, Saka, Wusun, or Xiongnu, crossing a vast highway of grass, has become such a hallmark feature of our history books that these pastoralists have been raised to an almost mythical status. Therefore, dogma dictates that “[t]he steppe belt, an immense swath of landlocked grassland, made possible the appearance of a unique historical phenomenon: the horse-breeding, highly mobile Eurasian nomad” (Soucek 2000:1 ). Contra to dogma, a new view of Central Eurasian prehistory is gradually taking the spotlight; this new model moves away from the notion of a ‘highway of grass’ and focuses more on exchange along the Silk Road, as well as the prehistoric manifestations of this exchange. In my studies, I have traveled through the mountain valleys of Central Asia, as opposed to taking an east to west journey across the steppe. The truth is that transport through these valleys is far easier than it is across the steppe, if not just for the availability of food and water for humans and pack animals, but also the greater population density leads to a far more accessible distribution of towns than could be supported on the steppe. Our trek through the piedmont and along the grassy valleys, which once fed the camels of Silk Road caravans, takes us through millennia of human history and shows us the backdrop for cultural developments that shaped humanity. 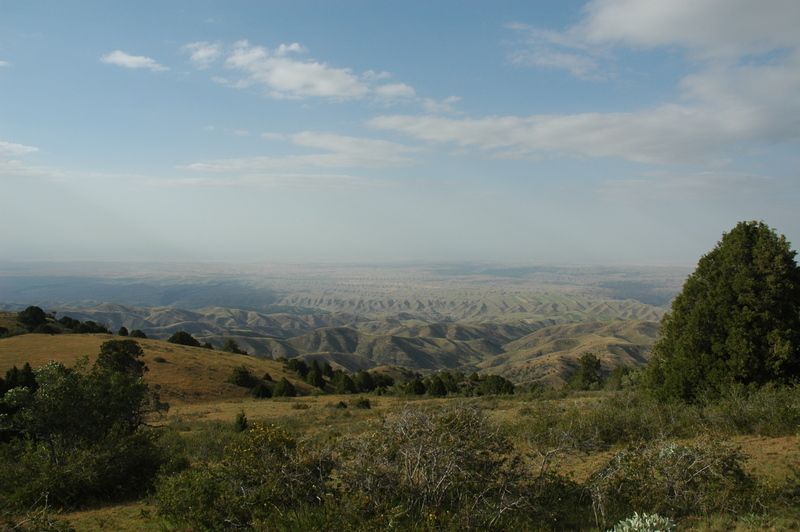 Throughout prehistory, people have preferred the biodiverse mountain foothills to the short-grass steppes, a preference that played an important role it the spread of plants along the Silk Road. The slopes of the mountains and the river valleys that bisect them are covered in natural resources, including fruits, nuts, wild roots, fish and huntable prey, as well as rich herd animal forage, water, and, most importantly for this book, arable land for growing crops. This foothill belt stretches along numerous mountain ranges and ultimately connects the disparate ends of Asia. In this sense, the foothills of Central Asia were the true highway for commerce, and therefore, played an important role in shaping your dinner table. If we revert back to the aerial view of the steppe and change our scale of vision, zooming in for a closer look, like a Seurat or Lichtenstein painting, the focus on the homogony gives way to a patchwork of diversity, the steppe is cut up by a lattice-work of rivers and streams, rock outcroppings, valleys, hills, diverse biotic communities, and even seas. In this regard, the steppe could more-productively be viewed, not as a facilitator of movement, but a mosaic landscape with patches of resources – notably water and herd-forage. Populations were brought into contact at nodal points on the landscape where resources were available [12, 13, 14]. Pastoralist communities revolved around these nodes, especially in the form of winter communal encampment; therefore, it is not the steppe matrix that holds the key for understanding human adaption to the flat lowlands, but the ecologically rich pockets within the steppe and the biodiverse ecotones on the edges of the steppe. These ecotones, more colloquially referred to as the foothills, are the real focus of this book and the key to understanding the routes of the Silk Road. 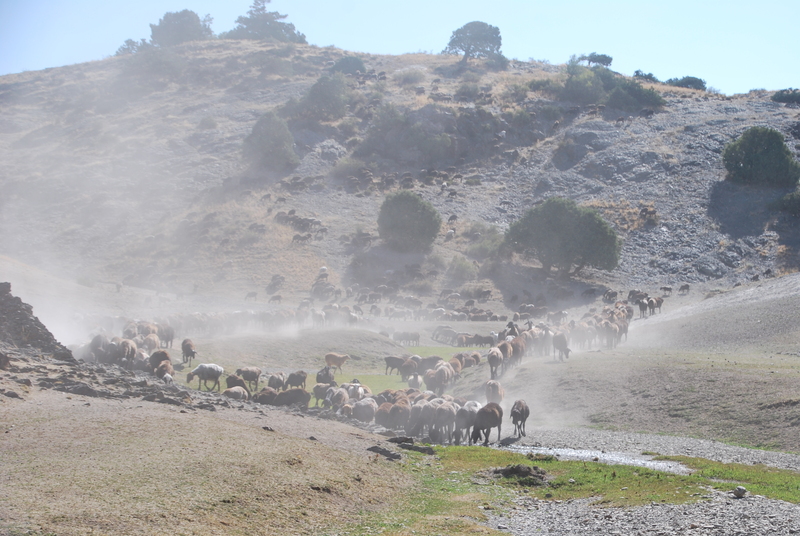 Rather than being the realm of nomads, much of the foothill zone was occupied by small-scale agropastoralists, at least as far back as the second millennium B.C., with large-scale commercial cities forming by the late first millennium B.C. Even a cursory look at the distribution of archaeological sites and the placement of people across Central Asia today, shows that human occupation clustered along the ecotonal zones between the steppe and the mountains. The people who did live on the steppe proper, focused their livelihoods on biologically rich microenvironmental pockets – essentially oases surrounded by short-growth sedges, dryland clump grasses, and Artemisia. A study of these environmental zones is vital to understand seasonal mobility patterns, adaptation, and the economy of people throughout Eurasian prehistory. The utilization of diverse resources, sprinkled across the complex sociogeographic landscape, would have required an elaborate traditional ecological knowledge system. Botanical resource availability was not only spatially but also temporally dispersed; vertical transhumance allowed people access to resources, including wild foods at various elevations and at different times throughout the year. The use of pasture land, arable fields, water resources, and gathered or hunted food would have required an intricate knowledge of vegetation and animal lifecycles, environmental processes, geography, and orographic mechanisms. Sheep and goats being herded to the watering hole in a valley of the Pamir in Uzbekistan, with a heavily over-grazed landscape of arid grass and juniper shrubs. K. E. Meyer and S. B. Brysac, Tournament of Shadows: The Great Game and the race for empire in Central Asia, New York: Basic Books, 1999. S. A. Stein, “Inner Most Asia: Its Geography and a Factor in History,” The Geographical Journal, vol. 65, no. 5, pp. 377-403 and 473-501, 1925. P. Hopkirk, The Great Game: The struggle for Empire in Central Asia, Tokyo: Kodansha International, 1990. J. Mirsky, Sir Aurel Stein: Archaeological Explorer, Chicago: University of Chicago Press, 1977. D. Rayfield, The Dream of Lhasa: The Life of Nikolay Przhevalsky (1839-1888), Explorer of Central Asia, London: Faber and Faber, 2013. L. B. Halper and S. Halper, Tibet: An Unfinished Story, Oxford: Oxford University Press, 2014. A. Abetekov and H. Yusupov, “Ancient Iranian nomads in western Central Asia,” in History of civilizations of Central Asia. Volume II, The development of sedentary and nomadic civilizations (700 BC to AD 250), J. Harmatta, B. N. Puri and G. F. Etemadi, Eds., Delhi, UNESCO Publishing, 1999, pp. 23-34. N. Ishjamts, “Nomads in eastern Central Asia,” in Ancient Iranian nomads in western Central Asia. History of civilizations of Central Asia, Volume II, The development of sedentary and nomadic civilization (700 BC to AD 250), J. Harmatta, B. N. Puri and G. F. Etemadi, Eds., New Delhi, UNESCO, 1999, pp. 151-170. J. Mei and C. Shell, “The existence of Andronovo cultural influence in Xinjiang during the second millennium BC.,” Antiquity, vol. 73, no. 281, pp. 570-578, 1999. S. Li, ” Interactions between northwest China and Central Asia during the second millennium BC: An archaeological perspective,” in Ancient Interactions: East and West in Eurasia, K. Boyle, C. Renfrew and M. Levine, Eds., London, McDonald, 2002, pp. 171-182. S. Soucek, A history of Inner Asia., Cambridge: Cambridge University Press, 2000. R. N. Spengler III, “Niche Dwelling vs. Niche Construction: Landscape Modification in the Bronze and Iron Ages of Central Asia,” Human Ecology, vol. 42(6), pp. 813-821, 2014. R. N. Spengler, Botanical resource use in the Bronze and Iron Age of the central Eurasian mountain/steppe interface: Decision making in multiresource pastoral economies, Washington University in St.: PhD Dissertation, Anthropology Department, 2013. R. N. Spengler, M. D. Frachetti and G. J. Fritz, “Ecotopes and Herd Foraging Practices in the Steppe/Mountain Ecotone of Central Asia during the Bronze and Iron Age,” Journal of Ethnobiology, vol. 33, no. 1, pp. 125-147, 2013.